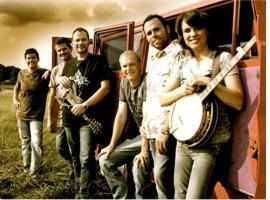 Grammy-Nominated Bluegrass Band The Grascals will headline the Sertoma Youth Ranch Spring Festival this weekend in Brooksville, Florida, near Tampa. The four-day long festival which begins today, March 26, and runs through Sunday, is a fundraiser for the Sertoma Youth Ranch, a not-for-profit organization with a mission to provide a rustic, outdoor recreational area for the children of Florida. Cross Plains, TN -- The Cross Plains Community Chamber has announced that The Grascals will headline the 2nd Annual Kilgore Station Bluegrass Festival, planned for April 25-26, 2014 at Kilgore Park in Cross Plains, TN. The Grascals are among the most beloved and acclaimed bands on today’s bluegrass scene, having won SPBGMA’s Bluegrass Band of the Year award in 2010, its Instrumental Group of the Year three years in a row (2011, 2012, 2013), the International Bluegrass Music Association’s Emerging Artist of the Year award in 2005 and earning its Entertainer of the Year honor in both 2006 and 2007. Catch The Grascals on TV Today! Nashville, TN --- Bluegrass fans have two opportunities to enjoy the Grascals on Saturday, 11/30. Four-time IBMA Banjo Player of the Year, Kristin Scott Benson, will join interviewer Steve Martin on his Unreal Bluegrass radio show in the 3 PM ET hour. Sonny Osborne will also join the conversation. Fans can listen in on the website at www.unrealbluegrass.com. The site includes many archived interviews with other great artists as well. Read more about Catch The Grascals on TV Today! Nashville, TN – The highly anticipated 8th album from The Grascals will be released on Tuesday, Nov. 19th. When I Get My Pay, from Mountain Home Music, is currently available for pre-order on iTunes. When I Get My Pay includes "American Pickers" video featured earlier on Cybergrass and is below. Nashville, TN -- One of the most awarded bands in Bluegrass, The Grascals, will appear on the world famous Grand Ole Opry Saturday, November 2, when they join Terri Clark, Deana Carter, John Conlee, Jeannie Seely and others for the Opry At The Ryman show. The Grascals will appear on the 7:00 p.m. and 9:30 p.m. segments of the show. More information can be found at www.opry.com. Out-of-area fans can enjoy the show via live broadcast at www.wsmonline.com. The Grascals have made a rapid band lineup change since we ran Bluegrass Fiddler Jeremy Abshire Begins his Next Music Chapter a few days ago. Yesterday, the super bluegrass music group, The Grascals, announced their new fiddler on Facebook, "Well, we thought we'd have to take more time to find the right fit, but when it's right it's right! We're pleased to announce that fiddler, Adam Haynes is the newest Grascal! We are so happy to have Adam in the band and look forward to all of you being able to hear him play. Yesterday, bluegrass fiddler with the Grascals, Jeremy Abshire, announced that he was leaving the band to start the next chapter of his musical career. In a comment on his facebook page, Jeremy says, "Friends, As some of you may or may not know, after Six years with The Grascals, a handful of recordings together, and a lifetime of memories, it's time for the next chapter of my musical journey. I wish the band much success and am grateful for my time there, and the many wonderful opportunities shared. I look forward to new musical adventures to come. I'm currently available for gigs, sessions, tours. Stay Tuned.."
Marion, VA- The award winning and high energy bluegrass band the Grascals will headline the Song of the Mountains public television concert taping this Saturday, April 6th at the Lincoln Theatre in Marion, VA. Also on the concert with the Grascals will be the old time music of the Whitetop Mountain Band along with two bluegrass gospel bands, the Easter Brothers and Jonathan Buckner and Chosen Road.